Well there's a thing I did not know. 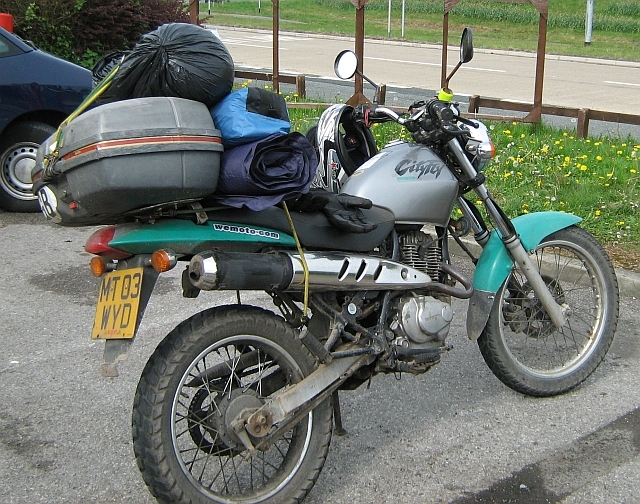 Back in't day (ie not that long ago) if you sold a motorcycle you'd have to fill in the V5 and send most of it off to the DVLA while giving a section of it to the new owner. While not exactly rocket science it could be a bit of a faff. Now it can all be done online. Apparently. I have not had the opportunity to try this out for myself as yet so please don't be asking me the ins and the outs of it all. What I can tell you is if you wish to do this then please click on the link. Keen eyed readers will note that this new fangled techno-wizardy will also allow you to inform the DVLA that you have bought a vehicle too. 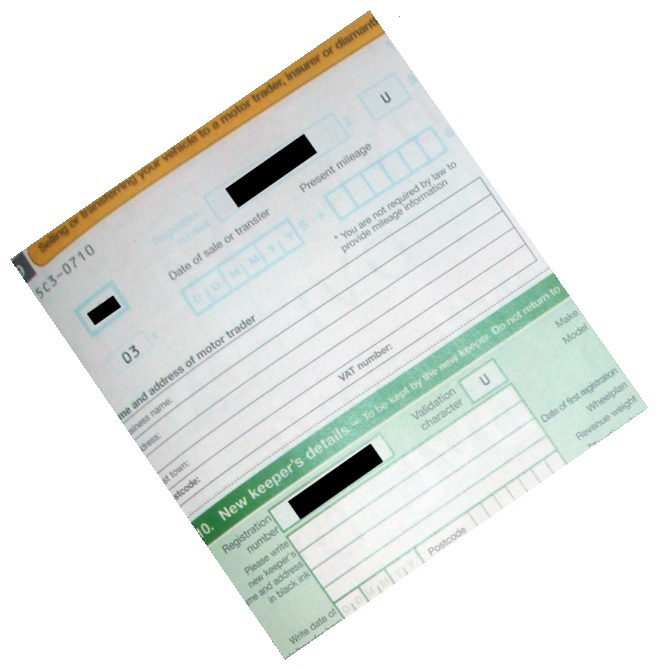 Therefore even if the vendor can't be arsed to fill in the online forms you can do it yourself. It'll make scrapping your old bike easier too. My initial concern is that of security. I am aware that V5s have a long long number upon them which presumably uniquely identifies that particular document. As such I expect this long long number will need to be entered into the system to confirm whoever is filing the change has their hands upon the V5. Despite this - if I were of a shady nature and stumbled upon a random V5 at a customer's place or an acquaintance's house what's to stop me quickly snapping the long long number with my handy portable camera come computer come datacentre we call a "mobile phone"? It's only a quick task to register the vehicle in my own name. Hopefully I'm not giving away too much information here. This may render the owner uninsured as many insurance policies are based up the insured rider as being the registered keeper. While the V5 is NOT proof of ownership it could make proof of ownership quite difficult. I hope there are systems in place to sort all this out, meanwhile I'll keep my V5s out of sight. Yes, did that when I bought the Norton back in September. I guess you're right that it's a security risk but not that great I think. I've just had a look at my bike policy and there's no mention of my having to be the registered keeper. Been using it for a while now. It's especially neat if you pay your road tax by direct debit because it automatically cancels the payment and even refunds any overpaid tax to your bank account. I've bought and sold 4 bikes since Christmas an the online system saves a huge amount of faff. Thinking about the security risk, why would anyone want a vehicle registered in their name when someone else is driving round through speed cameras and ANPR - you'd get all their tickets. Regarding the insurance and being the registered keeper. I too have had a look through my policy and I too cannot find any wording that requires me to be the registered keeper. However I know when I fill in the online forms it typically asks if the person creating the policy will be the registered keeper. Now what is written and what is asked are 2 different things. I am not a lawyer but I fear that if you tell the insurance you're the registered keeper then you have a claim then they find out you are not the registered keeper they *might* be able to use this to wriggle out. Call me paranoid or call me cynical of insurance companies - it's up to you. Regarding nefarious actions. Of course - why would you want a vehicle registered in your name as it could leave you liable to parking tickets and speeding tickets. Oh hang on...why don't I register my bikes in BOB's name!! What a great idea! That way I can ride like a plonker all day long and good ole Bob can take the wrap for me. Why did I not think of that before. Bob - once you've set up a DD does that apply to all your vehicles or do you have to do it separately for each one? I *think* I have one set up for the car but not AFAIK for the bikes. Ren, I'm sure you wouldn't get up to anything as bad as I get up to myself! Ian, it's one DD per vehicle so it's nice and simple. I've got 6 running at the moment and several cancelled ones. They automatically refund any tax if due when you sell the vehicle. If you change vehicles often (I have been known to buy and sell the odd bike), the DD tax solution is brilliant. If you only own the bike for 2 months you only pay for 2 months tax. Yeah - if I registered my bike in your name Bob the DVLA would know there was a problem due to the lack of offences against the vehicle. Dammit must try harder to be a badass biker. Just used this for the new owner of the Arrow and a very quick and easy process. ???? Well yes possibly but it just comes to my inbox with subject "PAS 313 Confirmation of vehicle keeper change" with all the details. I have a very good memory for numbers and passwords. Then one day I was sat next to the cash machine and I absolutely could not remember my pin code. I could not get any cash for quite some time. It was after my accident. Copious quantities of pain killers, rattled head and all that shook a few important details outta my noggin. I think I lost my sense of humour then too. Oh amd my charming character. I used to be nice once you know. Anyhoo the moral is that whatever you think you know might not be there one day. It is a concern. As I said you don't need a password to do the transfer.